In September last year, I gave my lazy arse a kick and went back to the gym. I'd ignored a very slow but steady creep for long enough but when I stood on the scales in August, I got a shock to see that I was about 6kg (almost a stone!) heavier than my usual 62kg. 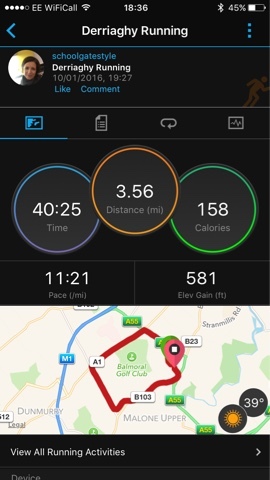 The house move and a couple of bad back episodes in the past year/18 months meant I'd let my exercise and diet slip and some bad habits had developed - things like eating in the evenings, glasses of wine mid-week and not doing much in the way of exercise. Straight away, I stopped eating after 7pm, cut out wine during the week and started Body Pump classes and Circuits - one of each class per week...making use of the gym membership at long last! By the end of October, I was amazed at the impact just those 3 changes had made. I'd lost all the weight and was starting to develop muscles again. Then I plateaued. Without a specific target, I was lacking in motivation. 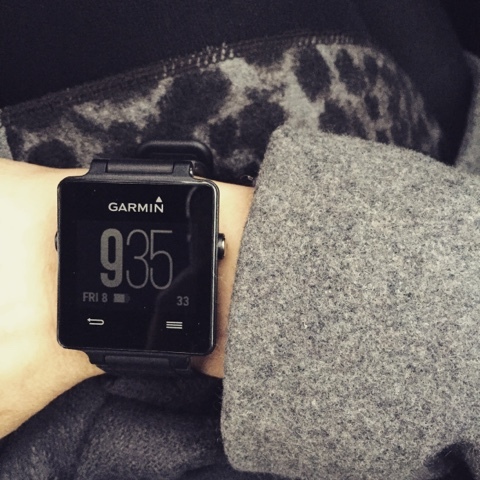 Step in the Garmin vivoactive® because in December, completely out of the blue, the PR people behind Garmin Ireland contacted me about road-testing one of their activity watches - perfect timing. 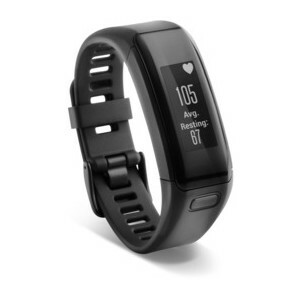 I chose the vivoactive® - a mid-sized ultra-thin GPS smartwatch with a sunlight-readable, high-resolution colour touchscreen and built-in sports apps, including GPS-enabled running, biking and golfing. Now I'll admit to being a bit sceptical about how much I'd use it. My initial thoughts were that it was just a fancy pedometer. But I was wrong - there's so much more to this. 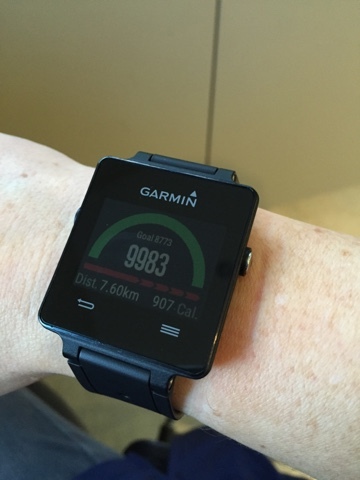 I get a buzz on the wrist when I reach my target (you can set this at whatever you want) - and that's such a motivator! It has also encouraged me to go out for a quick walk of an evening. Looking at your watch and seeing the true reality of a lazy Sunday afternoon (i.e. 800 steps for the whole day!) is a good wake up call for moving that booty. Sometimes it's just a quick walk around the block but the important thing is that there's no hiding behind the stats and there's a competitive aspect to it too as I don't like to see my weekly average falling! But there are two benefits to this watch that I never expected. 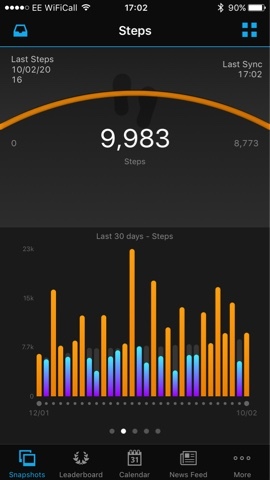 Two things that for me, make it worth owning more than any activity monitoring..
First unexpected benefit is that it hooks up with your watch and alerts you when you get texts/calls/social media activity. Now this may annoy some people and it's obviously up to you whether you enable this functionality but for me, this is an amazing thing. I'm that forgetful person who leaves her phone on silent and misses calls and texts all over the show. The watch had resulted in me not missing a single thing for the past month. It's perfect for when you're in meetings (or in church!) but mostly when driving - no need to look away from the wheel. 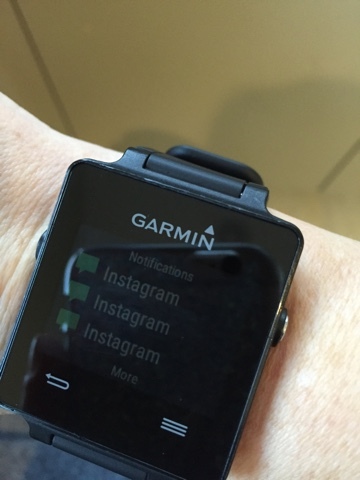 A quick glance at your wrist and you know who's trying to get in touch. You can't reply or speak into it like you can with some other smart watches but I don't want to do that - all I need to know is if there's activity that requires a response. It's been brilliant for the blog - I can see when people comment and react to my posts and when the shop was open, I could see when orders came in. All without having to use my phone. Oh and when you drive off, leaving your phone on the charger at home, you get a 'phone disconnected' buzz before you've gone too far...BONUS - no more forgotten phone! but I've also seen how having a drink results in a much more unsettled night's sleep. How going to bed later than midnight results in a poorer rest. 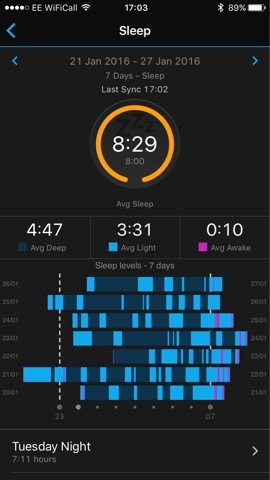 How exercise really does help you achieve a restful night (on one particularly active day last week, I got over 5 hours of deep sleep! )....but for all your parents out there, I have scientific measured evidence that when kids wake you up in the middle of the night, your deep sleep doesn't really come back after that....you tend to stay in a light sleep mode for the rest of the night. Which is why, even though on paper, you got 7 hours, that unexpected sudden wakening makes for an overall more unsettled night and a more tired Mamma in the morning. So this watch is ticking boxes for me on the basis of sleep alone - it's the first stat I check each day when I sync the watch to my phone. I should point out that I have no idea how it measures the sleep other than on a movement basis? I'm sure there's a whole section in the manual about this but who reads the manuals? Not me. The other disadvantage is that I have become so addicted to this watch, I've not really worn any other since early January! My Michael Kors and my DKNY, which were on heavy rotation prior to the Garmin coming along are looking very lonely. But it doesn't mean I'll never wear them ever - I do pop them on now and again and I'm sure I'll rotate all three of them in time - using the Garmin perhaps only when I'm training (and sleeping!). Time will tell. Disclaimer - I was provided with this Garmin watch free of charge but was not obliged to blog about it, nor was I paid to. All opinions expressed are my own. Thanks for supporting the brands that support this blog.